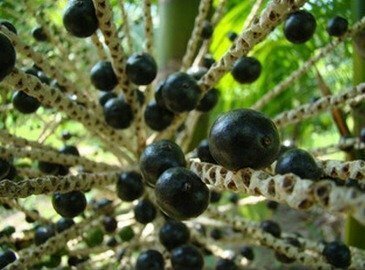 The acai, (Euterpe oleracea Mart. ), also known as Assaí, huasai, or manaca palm, is widely distributed in the Amazon, and in many parts of the Amazon as a fruit juice, and when cassava flour is added its consumed as a soup. Its fruit it’s an oval shaped berry, purplish in colour and is red when ripe and green when under ripe . It has been used since ancient times by Amazonian tribes as part of their food and to fight diseases. Studies show that acai contains polyphenolic compounds, mainly anthocyanin type, and it’s Considered a super fruit, for its vitamin C, calcium, iron and aspartic and glutamic acid content. From the Department of Food Science and Human Nutrition at the University of Florida (USA), it has been recognized as interesting for use in nutraceutical products for the extensive range of functional properties attributed to food. Known by nutritionists as a super fruit, acai can help you not only lose weight but maintain a healthy weight. An interesting study found that acai pulp had the ability to reduce the negative effects of a high fat diet. The content of vitamin C promotes collagen formation which promotes healthy skin and allows antioxidants fight free radicals environment. The Acai can help keep our digestive system clean and optimize its function. The berries have powerful capabilities in the detoxification within the human body and are well known as a traditional source of dietary fiber. Anthocyanin’s found in the Acai cell play a role in cellular protection, helping to maintain strong cells, helping the fight against free radicals. Rich in antioxidants, acai contribute to the ability to slow or reverse the typical aging processes related to oxidative damage. In fact, berries of the acai are one of the fruits with the most antioxidants, they have ten times the amount of antioxidants of grapes and twice the amount of blueberries. The acai contraindication is considered safe; since it is as natural as any other fruit. It is no more dangerous to health than an apple or a banana. in fact, not only is acai berry safe, it's healthier than most existing fruit. In the literature I have found no reports about contraindications to the use of acai, and possible drug interactions. However remain clinical studies at different doses and at different treatment times to assert their safety, but their safe use is established by the traditional use for hundreds of years by the Amazonian tribes. Due to the high concentration of nutrients in each of our powders, it is suggested to start with only one intake, a teaspoon a day. Once you are comfortable with Acai and its effects on your body, you can gradually increase the daily dose. While these are the recommended serving sizes is always a good idea to be aware of any reaction that the body may have to the drink, and increase or decrease the size of your personal dosage. 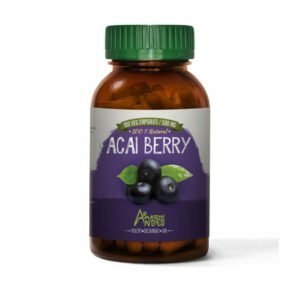 However, acai, being considered a nutraceutical, does not require a prescription, and the demonstrated safety of acai easy to use. The suggested dose orally include 1 ounce of powder mixed with 10 to 12 ounces of water once or twice daily, or freeze-dried Açai in capsules or tablets, 1-2 grams per day i.e. 2 to 4 capsules per day acai . General: Brazilians usually drink up to one liter (34 ounces) daily of acai juice, the roots of the acai palm tree are prepared as a tea, and 1-2 cups of which are taken orally, daily. The Acai has different presentations according to their different processes, but has proven effective in each use.